Story : The first leg of the USS Enterprise's five year mission takes them into uncharted territory. There the Enterprise is nearly destroyed and strands Kirk and his crew on a remote planet with no means of communication. Kirk must then work with the elements to reunite his crew and get back to Earth. 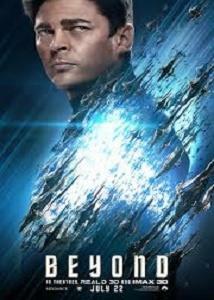 While Star Trek Beyond is chock-full of relentless action sequences (the first one, barely ten minutes into the film) and breathtaking space scenes, Lin and the writers of this film have taken things beyond just making stuff blow up in a dramatic fashion. A big part of the original Star Trek's charm lay in the way the characters got along and you'll see that here too. Spock (Quinto) and Kirk (Pine) have a strong mutual respect along with being great friends. But Trekkie diehards will know that Spock and the ship's cranky doctor, Bones (Urban), had a rapport that was more lighthearted and allowed for humorous moments too. The same goes for the engineer of the USS Enterprise, Scotty, who brings his own brand of wit and humour to the movie. And so, you'll find a decent blend of seriousness and action as well as subtle humour. Lin has also taken a few risks in the film and balanced that off by also remaining for the most part, faithful to the original series. So there's plenty enough to excite, but it's not so radically different as to make long-time fans wonder about what the heck is going on.